This is a hard blog entry to write. I made a decision not to include in my book reviews a children’s book that in some ways has fabulous potential. 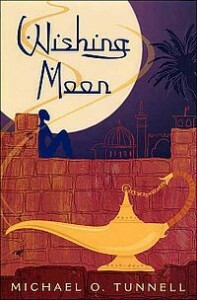 It’s about a young girl who finds Aladdin’s lamp, unleashes the genie, and uses her wishes to do good in the world. A great premise, a lovely point to get across. So why did I reject it? Right in the opening pages, we see the young girl as a poor beggar. She looks out and sees another girl her age, making the decision to survive by prostitution. Why would an author put that idea into a children’s book? It is so jarring to me, and so out of place, that in the end, I just can’t recommend the book. Like one bad apple ruining a barrel, one bad line has ruined what could have been an uplifting read. Too bad.